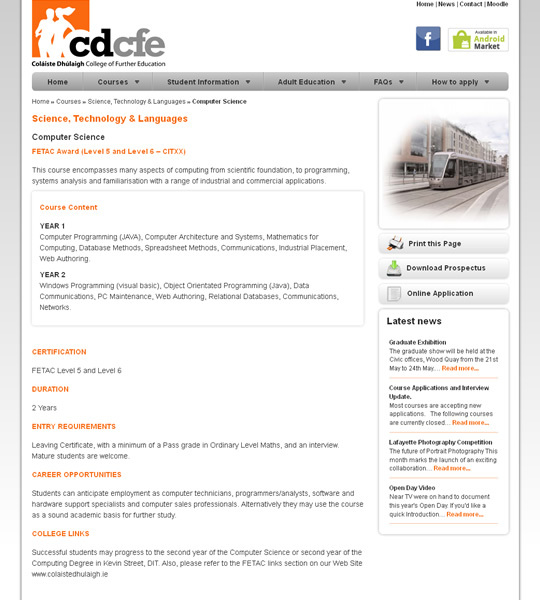 Colaiste Dhulaigh College of Further Education is located on four campuses, Coolock, Raheny, Kilbarrack and Malahide. Colaiste Dhulaigh College of Further Education provides programmes delivered by a team of tutors dedicated to the highest standards of teaching and learning in a caring, supportive and friendly atmosphere. Enhance have recently re-designed the main website for the college including the design of a new logo which incorporates he memorial statue to the Stardust victims. In additional to the main website, we have worked with the IT department in the college to create a set of tools for the staff to enable them better document and measure course success. We have offered consultancy services to the college on a range of activities over the years including, email marketing and social media strategy.